English phrasal verbs consist of a simple verb combined with a short word called particle – such as ‘on’, ‘up’, ‘down’ and similar. Typical examples of English phrasal verbs are ‘to put down’, ‘to find out’, and ‘to come back’ and as you can see the meanings of these simple phrasal verbs are self-explanatory. Obviously ‘to put down’ something indeed means that you have to put the respective object down, and you don’t have to be a genius to figure out that ‘to come back’ means exactly what it is – ‘to come back’! But what if I told you: “I think we’ll have to put it off”? Would you still guess that the phrasal verb ‘to put off’ means ‘to postpone’? I think you have to agree that it’s not that easy, and here we’ve arrived at the vast amount of different English phrasal verbs that you have to learn before you can understand their meanings and start using them in your daily conversations. ‘To get by’, ‘to get along’, ‘to call off’, ‘to run out’ – all these seemingly simple yet so distinct phrasal verbs have meanings you’d never think of yourself! ‘I’m making enough money to get by’ means that I have just enough money to afford the basic things. If I’m asking you: “How are you getting along with your new co-workers?” I want to find out if there’s a friendly atmosphere among you and your new colleagues. So as you can see, you need to know meanings of these exact phrasal verbs to understand them even within context and also to be able to use them! Taking into account that there are hundreds of phrasal verbs in English language used in every possible life situation, you simply can’t ignore them! You’re probably thinking – “Phrasal verbs? All right, it sounds useful, but is it really that necessary? If I haven’t paid much attention to them by now, surely I can do without them in the future!” Well, I have to tell you that you’re not entirely right in saying that. Of course, you can do without them, but you’ll miss out on so many benefits that the phrasal verbs can give you that it just wouldn’t be wise. And by the way – did you notice that I used two phrasal verbs in the previous sentence – ‘to do without’ and ‘to miss out’? So here’s why phrasal verbs are actually crucial for any English learner! First of all, you have to become aware of the fact that spoken English is literally packed with phrasal verbs. And as you definitely want to learn efficient English communication, it’s important that you learn to speak fluently and easily. So while there’s nothing wrong with using formal words like ‘to extinguish’ and ‘to dismantle’, using their phrasal verb versions ‘to put out’ and ‘to take apart’ is so much easier in a conversation! Traditionally English is studied using textbooks that are written using quite formal language, and that can be one of the reasons why foreigners struggle with effective English communication. You see – English language you’ve used to read and write doesn’t always follow the same patterns as spoken English. I’m not saying that normal English grammar doesn’t apply when speaking. Nonetheless, phrasal verbs definitely change the language and make it more friendly, easy-to-understand and easy-flowing. To clearly see my point, let’s compare two sentences – one in formal, written English and the other – spoken English. Let’s say, this is what it says on your work contract: ‘Company’s employees are required to inform the management about taking the annual leave at least sixty days in advance.’ And this is what your new manager tells you on the induction day: “You have to hand in a holiday request at least sixty days in advance.” Do you see how a formal request is being paraphrased in conversational English using the phrasal verb ‘to hand in’? And mind this – it’s not only about informal conversations! Now pronounce those two sentences. Don’t you agree the first one is easier to pronounce and it kind of ‘flows’ out of you mouth easier? It’s all because the phrasal verb ‘to break down’ consists of simple English words and eliminates the need to use a whole string of words ‘to calculate regional sales figures’! And if this still hasn’t convinced you that phrasal verbs are a must-have for any English learner, here’s the second aspect. As you saw in the example with the phrasal verb ‘to break down’, you can easily substitute a string of long words with a single phrasal verb. That makes the English conversation natural and fluent, and you have to agree that spoken English fluency is one of your English language study’s main goals! Until now you’ve probably held the opinion that the bigger your English vocabulary becomes, the more fluent you’re automatically going to become. Most likely you’ve just focused on working with textbooks and using other techniques to memorize as much English as possible. While technically it is true and you can’t speak English without vocabulary, you also need to be selective as to what vocabulary you use in your spoken English. What I’m trying to say is that on many occasions it will be much easier for you to speak English if you go for more natural, friendly means of expression, and phrasal verbs provide you with exactly that! 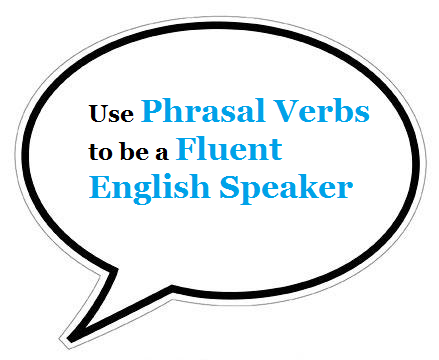 And by the way – phrasal verbs make your English speech sound more like that of a native English speaker. While there’s nothing wrong being a foreigner and you should never be ashamed of your origins, speaking in a native manner definitely makes your speech more understandable and it’s only a bonus. So if you learn at least the most commonly used English phrasal verbs, you’ll definitely increase your overall English fluency and understanding. If you can say a sentence like: “You can end up being broke if you carry on gambling” you’re going to sound more native and easy-going than if you said: “You risk eventually becoming broke if you continue gambling”. And here’s another great benefit to using and knowing English phrasal words. You can start speaking fluent English much sooner if you learn phrasal verbs as they consist of simple verbs that you’re already familiar with. Majority of English phrasal verbs are formed using basic verbs like ‘to get’, ‘to take’, ‘to make’, ‘to look’, ‘to bring’, ‘to give’ and similar. So instead of learning and memorizing plenty of new formal English words you can use your existing basic English vocabulary wisely and form dozens upon dozens phrasal verbs. This way you can start speaking fluently much faster and work on building up your formal English vocabulary afterwards! Whenever I mention 'phrasal verbs' the first question from my students usually is "Are they used a lot in English?" They don't like the answer. But introducing the key phrasal verbs early on in their learning they get more and more relaxed about them. Having a good understand of phrasal verbs and being able to use them in conversation does wonders for confidence. I've just got everything I used to wonder about phrasal verbs! Thanks a bunch! I have understood now by your explanation that Phrasal verbs are invaluable source for better communication.Thank you sir. I have a question to you sir, whether Phrasal verbs are used while communicating with superior people(boss etc. ).I am asking this question because I am a non-native speaker. Phrasal verbs show a very good command of the English language so they are appropriate to talk to work colleagues and managers.